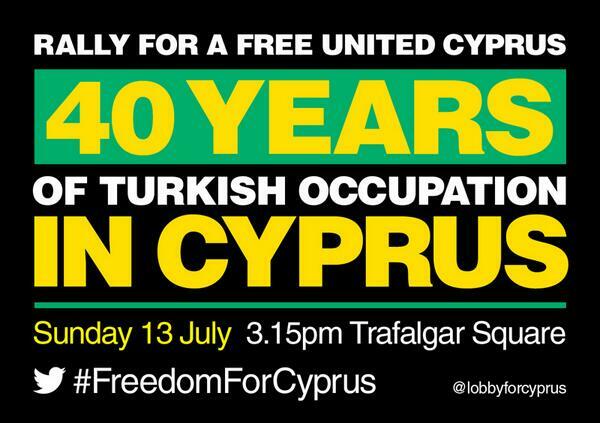 Call for freedom and human rights on the 40th black anniversary of the 1974 Turkish invasion and continuing occupation in Cyprus. Join us and demand the removal of Turkish troops, repatriation of Turkish colonists and the right of refugees to return. In 1974 Turkey invaded Cyprus, illegally dividing the country and committing war crimes and mass human rights abuses. 200,000 Greek Cypriots were ethnically cleansed by the Turkish army. Violate international law and United Nations resolutions that demand the withdrawal of the Turkish army, the right to return for Greek Cypriot refugees and an end to Turkey's policy of colonisation. Maintain its illegal apartheid regime in the occupied north that discriminates against Greek Cypriots by preventing them from returning to their homes and lands. The Greek Cypriots are the legal owners of 92 percent of land in the occupied north and we call for the right to return. We will never give up our lands and properties to those who seek to profit from their theft and illegal purchase. The human rights of the Cypriots must be restored so that Cypriots can live in a truly reunited Cyprus with the full fundamental rights enjoyed by all other EU citizens. 3.15pm: Rally at Trafalgar Square.